We would greatly appreciate if you are interested in participating with an artist profile in 'ART FOR SALE' that a new Masters of Today (MOT) art book project for contemporary artists, art galleries and art museums, to get on the most research-driven list of the worlds best active collectors and others who uses Masters of Today (MOT) art books series to permanent collect and review contemporary art. Ensure that your are including your most iconic works of art. Who are using Masters of Today (MOT) and World Of Art (WOA) publications are also used by leading art museums, art biennials, cultural centres, art fairs, curators including among others: The Museum of Modern Art New York; The Guggenheim Museums in New York, Las Vegas, Bilbao, Berlin and Venice; Museum Ludwig, Cologne, Germany; TATE Modern and TATE Britain United Kingdom; Moderna Museet Stockholm, Sweden; Castello di Rivoli Museo d’Arte Contemporanea, Torino, Italy; ARC /Musée d’Art Moderne de la Ville de Paris, France, are also used bySTARKE Foundation Germany; Venice Biennial; Manifesta; Art Basel, Art Forum and others. 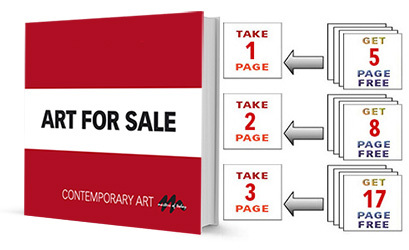 Masters Of Today (MOT) Publishing is happy to welcome artists and art galleries to list in 'ART FOR SALE' the new art book project from Masters of Today (MOT), that is a high quality rare and important art publication dealing with fine art for sale. • ‘Art for Sale’ is the 1st choice for artists, galleries and buyers alike! • ‘Art for Sale’ is an effective tool for fine artists and art galleries to market and sale theirs art in a professional manner to the international community of art buyers. • ‘Art for Sale’ is the premier art book for those seeking to sell and buy original art. Please be sure that you accurately specify the work details: the title of the work, year, technique, size, price and condition of the piece. Please be sure that you accurately specify the contact details: the place you live and work, your website, email address, phone numbers. Should you feel difficulty in choosing any artwork presented by ‘Art for Sale’, we would gladly assist you in making a perfect choice. We have highly skilled art historians and designers, who will help you in ‘Art for Sale'. • The cost of advertising for fine artists is tax deductible. • The advertising fee should be provided after notification of acceptance and after receiving a layout alternative in the book. • Masters Of Today (MOT) Publishing is not responsible for the selling or shipping of the artist's work, all financial transactions are strictly between the Buyer and the Artist /Gallery. • We are offer buyers high-quality artworks created by professional artists. All listed art-works must be originals. • All works of art presented by ‘Art for Sale’ would be meticulously checked and carefully selected by a team of experienced professionals. • ‘Art for Sale’ practically lists all art styles and directions; therefore, we are sure that the Buyers will certainly find exactly what they need.